API Explorer is a ProcessWire module that creates an application in your admin "Setup" navigation. 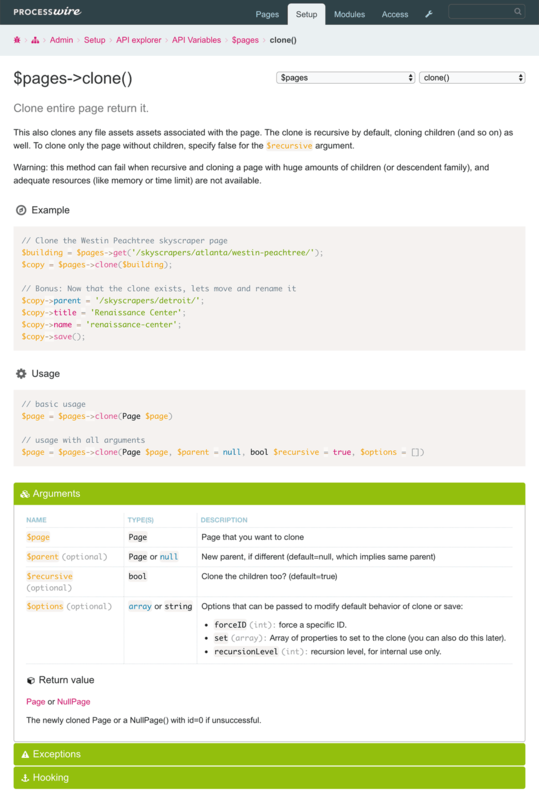 It provides comprehensive code documentation for ProcessWire API variables, classes and modules. It compiles this information using a combination of existing PWDOC tags, PHPDOC tags, and the PHP Reflection library. Meaning, this application doesn't contain the documentation itself, but rather compiles it by performing comprehensive static analysis directly on the code it documents. A significant benefit to this approach is that the documentation is always up-to-date with the version of ProcessWire that it is running on. While all of the information presented by API Explorer can also be determined by other means (including our own online API reference) the API Explorer module presents it in a manner that is ideally suited to ProcessWire developers and development processes. API Explorer is the only tool that enables you to see documentation directly mapped to the version of ProcessWire it is running on. API Explorer is like having a comprehensive ProcessWire reference book on your table, ready to use anytime whether online or not. 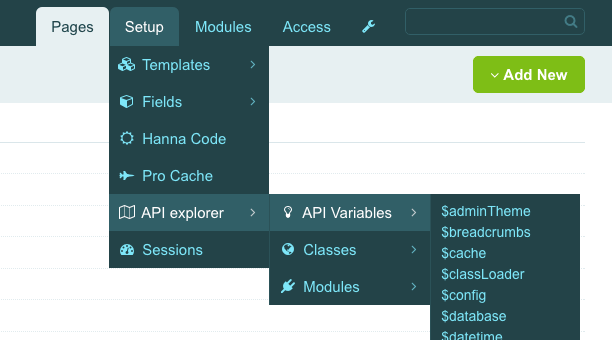 If you develop anything in ProcessWire, we're confident API Explorer will be one of your favorite tools! Easily navigate methods, public properties and constants. 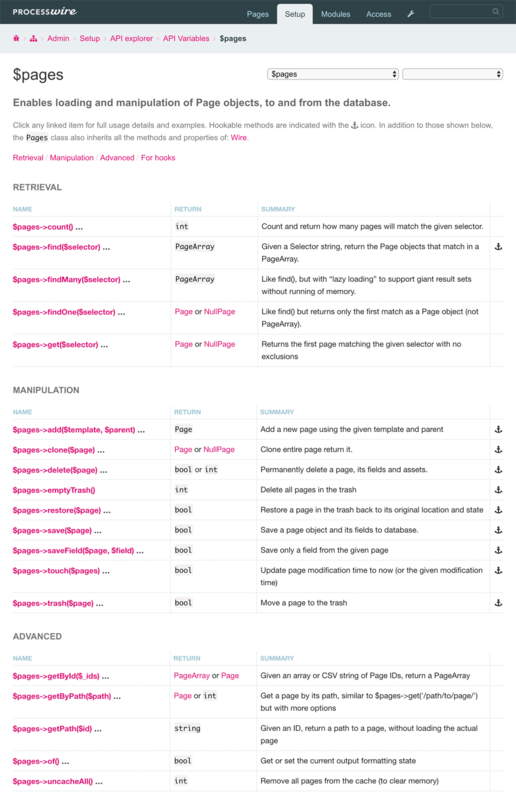 Covers all of ProcessWire's API variables, core classes and most modules. Also is able to cover 3rd party Wire-derived classes and modules that are documented with phpdoc (and/or pwdoc if used). Many methods and classes include usage examples and further discussion. Complete coverage of method argument types, required vs. optional arguments, and return types. Cross reference links between related methods, argument types and return types when appropriate. On-the-fly ability to hide method arguments, show all arguments, or show only required arguments. 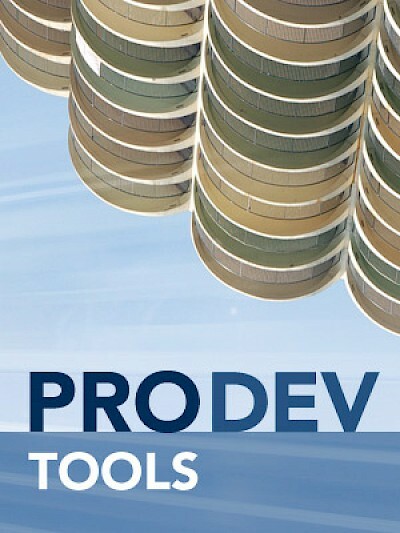 API Explorer is part of the ProDevTools set of modules and currently requires ProcessWire 3.0.40 or newer. In the near future, API Explorer will also support ProcessWire 2.8 as well. API Explorer does not work with ProcessWire 2.7 and earlier. ProcessWire API Explorer is Copyright 2016 by Ryan Cramer Design, LLC.